Midterm Report: How has Tim Krul performed so far? It it easy to quickly move on to the coming Premier League fixtures and focus on the future as a football fan, but sometimes looking back can yield some interesting and often crucial analysis which can help benefit future performances. Managers across the world usually re-watch entire game footage to point out areas which need improvement in future fixtures and this applies to many team sports. As a Newcastle United fan, I thought it might be useful to look at each individual player that has donned a Black and White shirt this season so far and give them a sort of ‘Midterm Report’ as I like to call it. In the following series, starting with the goalkeeper Tim Krul I plan to give a balance and concise report on his performances from the beginning of the Premier League season all the way through to mid January (his last game against West Ham). Each report contains a brief overview, a few stats, and a rating (gold number). Hopefully by the end, you as readers can offer your own insights and opinions on each player and collectively we can get a general consensus of our season so far. Story so far: Tim Krul has been ever-present in the Newcastle United goal this season. The 25 year-old has impressed between the sticks per usual and put himself on the pedestal of world football in late 2013 when he made 14 saves - a record number of stops against Tottenham Hotspur at White Hart Lane, in the Premier League. His agility and quickness showed with a couple of phenomenal saves from Roberto Soldado and a Christian Eriksen free-kick. To say he has a had a perfect season so far would be a little too far as he is prone to the odd mistake, and his distribution can also improve, but all in all, a solid season as expected for the Dutchman who is no doubt eyeing up a spot at the 2014 World Cup. Moment of the Season: His 14 saves against Tottenham Hotspur to help secure a precious away victory against what was then Andre Villas-Boas’ side. So there is my quick review of Tim Krul so far this season. I don’t plan on delving into too many individual performances as I want a concise account of each player, however; outfield players will be talked about in different depth in the coming posts. 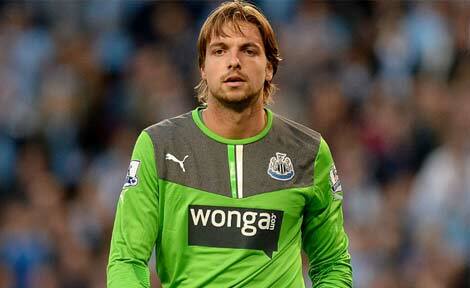 What are your thoughts on the performances of Tim Krul this season? Comments in the section provided below please, and make sure you give me a follow on Twitter @KevinDoocey and like Tyne Time’s Facebook page!